This entry was posted in essays, narcissism and tagged danger, emptiness, malignant narcissism, narcissism, New York City, urban blight, Wolfen by luckyotter. Bookmark the permalink. What a beautifully written piece. This is the best of yours that I’ve read yet. What a magnificent mind you have. I was thoroughly absorbed while reading this and was sad when it ended. I was sad that it had to end. I mean I just could have kept reading. I loved it that much! Ya that was great! Reminds me of my fascination with True Blood, altho I hated the characters I couldn’t stop watching. I know that feeling. I used to follow celebrities I couldn’t stand, just because I couldn’t stand them. I think that’s called a hate crush, but this is a little different. Like a morbid fascination, like ogling a car wreck maybe? LOL I remember Wolfen! I dunno – when I see narcs I’ve known write online, like posting on a mutual friend’s page or blog or whatever, I just see more and more BS. I see the denizens oof urban blight making beauty out of it — they reclaimed abandoned buildings and made them liveable for those with no roofs over their heads. Spray-painted designs others call “vandalism” were more beutiful and vibrant than the ads and logos they’d have plastered everywhere. Made films on those lots with used 8 milimeter cameras found in Chinatown and shoestring budgets. Narcissism I see as the opposite almost. Instead of finding the beauty in urban blight, you could show them a rose garden and they’ll dump weeds and toxic waste all over it for some imagined slight! BTW, I clicked on one of the older posts on the side about “12 Weird Things Narcississts May Do” and am curious if you could link me to any source material for one of the things written? Regarding correlating narcissism and occultism in particular…if there is any articles claiming such a link I’d like to see it? I’ll definitely look into this, what source material for which article do you need? I just went to watch the trailer of Wolfen because I don’t remember if I saw that movie or not. But the voice-over in the trailer sure takes me back. It’s a weird kind of trigger. I remember sitting in my home town movie theater many a Friday night hearing that voice before a movie started. I think he did all or most of the horror flick voice-overs back then. Nicely written by the way. I was there in that run down ‘hood as I read. I had a friend (actually she is still a friend–since 1975!) 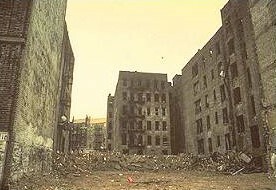 who actually grew up in the south Bronx at it’s worst (70s and 80’s) whose family were pretty much the only non-Hispanic whites living there at the time. But she is dark so could pass as Hispanic. I used to be fascinated with the stories she told about growing up in the ‘hood. But it also has a colorful history–it was the birthplace of hip hop. I saw Wolfen years ago. I thought it was a pretty decent movie for its time, but I was most taken with the photography, which I found beautiful in its desolate way, and a perfect setting for a horror movie. I’ll have to see if the library has the movie. It’s on Youtube but it’s not free. Reading about Brooklyn seemed to take me back to the darker corners of southern Hell, er California. No, they didn’t call those ‘dread zones’ *tenements*, but still, the rumors I heard had enough local color to make them believable, e.g there was a street in Chino (the land of the Chino Sinners – kind of like a homegrown version of MS-13) that if you went there and didn’t Live there – you would be killed on the spot. Predation – a theme in most werewolf movies – was a fact of life. That’s what I feel is part of being a M-N: the taste of blood on one’s tongue, and the raving hunger for ‘the raw meat and steaming blood of sacrifice’ that’s the for most thought in one’s mind. The best sacrifices are unsuspecting and innocent; and one’s meals of that kind are best seasoned with screaming.